Mordor is a pretty big place, and from what the works of Tolkien has taught us, it’s apparently exclusively filled by an orcish military. Traversing across it isn’t as simple as picking up a travel guide from Gondor’s STA shop. With all those warbands and blood-thirsty chieftains out there, inside information is vital. Thankfully in Middle-earth: Shadow of Mordor, you’ll be able to ‘befriend’ Ratbag: a snivelling greenskin who’s willing to tell you all the juicy bits from the book of Orc Warmongering, provided you help him make it to the top. 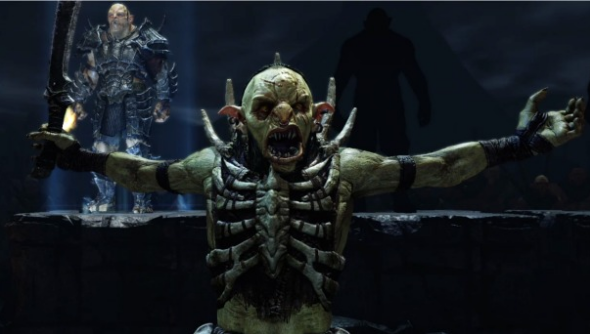 Ratbag is interesting as far as Shadow of Mordor goes in that he’s a predefined orc character. Every other uruk in the game is uniquely generated by the Nemesis System, a really quite-brilliant-sounding set-up that allows the military hierarchy of the game to bend, buckle, break, and reform depending on your actions. Our Jules explains what it’s all about inhis preview from Gamescom. Ratbag will be essential in your plan to subvert the uruk armies, with his information providing the context you need to plan what general you decapitate next. And the higher the rank that Ratbag gains, the better intel he can provide. Middle-earth: Shadow of Mordor blows its warhorn and marches into release territory on October 3rd.